Born: 20 April 1861, Wickham Bishops, Essex, United Kingdom. Died: 9 May 1944, Northampton, Northamptonshire, United Kingdom. 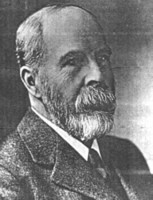 Hugh Neville Dixon, a leading British authority on mosses, lived all his adult life in Northampton as a teacher of deaf children. He studied in the classics and obtained his MA degree at Christ's College, University of Cambridge, in 1883. Thereafter he started teaching, until his early retirement in 1914. As a keen naturalist from an early age he developed a life-long interest in botany while still a student at Cambridge and throughout his life produced a steady stream of botanical papers. In 1883 he became a member of the Northampton Natural History Society, serving as its secretary for 45 years. He was elected a Fellow of the Linnean Society in 1885, at the young age of 24, and served on its council from 1925 to 1930. In 1923 he became the first president of the British Bryological Society. Dixon travelled widely in the United Kingdom and also visited Lapland, Austria, Portugal, Sicily, Tristan da Cunha and other places, often with his friend William Nicholson, who was particularly interested in liverworts. Dixon came to be recognised both nationally and internationally as an expert bryologist. He described many new species and two mosses are still named after him. His bryological papers dealt with, among others, the mosses of the Canary Islands (1908), the Atlantic islands (1909), India (1910), Teneriffe (1911), Uganda (1918), Antarctica (1920), Dutch New Guinea (1922), the Malay Peninsula (1926), the Gilbert Islands (1927), North China, Mongolia and Tibet (1928), Waziristan (1929), Fiji (1930), the north-western Himalayas (1930), Spitzbergen (1931), Sumatra (1932), Hong Kong (1933), Celebes (1934), Borneo (1935), South Georgia (1935), Laos (1936), Ceylon (1938), Mauritius (1938), East Africa (1938), and Madagascar (1942). He also published two books on mosses: The student's handbook of British mosses (Eastbourne, 1896; 2nd ed. 1904; 3rd ed. 1924; reprinted 1954, 1970) and Studies in the bryology of New Zealand (1929). Much of the material he collected went to the British Museum (Natural History). A number of Dixon's papers dealt with the Bryophyta of Africa (including southern Africa) and some of these were published locally: "New and interesting South African Mosses" (Transactions of the Royal Society of South Africa, 1919-1920, Vol. 8, pp. 179-224), "New and noteworthy mosses from South Africa" (with H.A. Wagner; Ibid, 1930, Vol. 18, pp. 247-262), and "Bryophyta of Southern Rhodesia" (as co-author of T.R. Sim*; South African Journal of Science, 1922, Vol. 18, pp. 294-335). His help is furthermore acknowledged in the introduction to Sim's monograph on The bryophyta of South Africa (1926). Google scholar. http://scholar.google.co.za/ , publications by H.N. Dixon. Lawley, Mark. Hugh Neville Dixon (1861-1944). Google: Hugh Neville Dixon. Sim, T.R. The Bryophyta of South Africa. Transactions of the Royal Society of South Africa, 1926, Vol. 15, pp. 1-475.